Last Tuesday, I celebrated my 20th birthday! Of course, I had to do a special birthday manicure :) Last year, I did freehand ice cream cones. This year, I decided to go with birthday cupcakes! Here's a huge picture of them! I worked hard on these and used lots and lots of different polishes. To see exactly what I used, keep reading! On each finger, I am wearing Sally Hansen Pacific Blue as a base. The sparkles on the frosting on all the cupcakes and my middle finger is Sinful Colors Hottie. The rhinestones are from Born Pretty Store. So, there you have it! Altogether, I used 12 different polishes to do these cupcake nails. I actually did not use a brush for these, just a dotting tool. 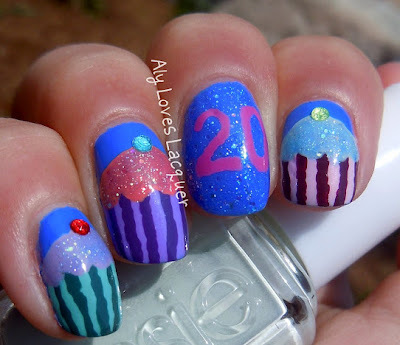 What do you think of this festive birthday manicure? 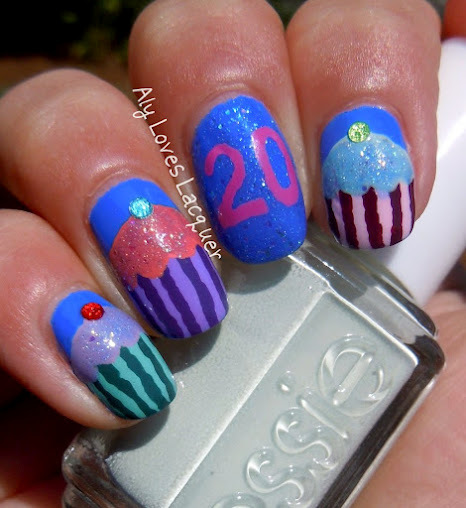 Oh my gosh, this mani is so freaking cute!! I absolutely love it. It's perfect. Happy 20th birthday! Thanks so much :) And that compliment means a lot, I have been struggling to pick a shape lately! It's perfect?! *blushes* Thanks so much!